You don’t need to keep your eyes peeled for wild garlic-the smell alone will alert you to a clump of plants. I have my favourite spots where I know I can find some Allium Ursinum –Bear’s Garlic – and every spring I arm myself with a small knife and a plastic bag and go a-foraging. This year I even found some wild garlic in an enterprising farm shop although I think it is yet to hit the supermarket shelves. Apart from elderflowers, brambles and horseradish I’m not a great forager and picking in the wild can be hazardous and downright dangerous but the joy of wild garlic is that it is unmistakable. The smell is more pungent than the flavour- it is more like a leafy chive and won’t leave you with the pongy aftertaste for days and days. The flowers are edible too but only eat young small heads. 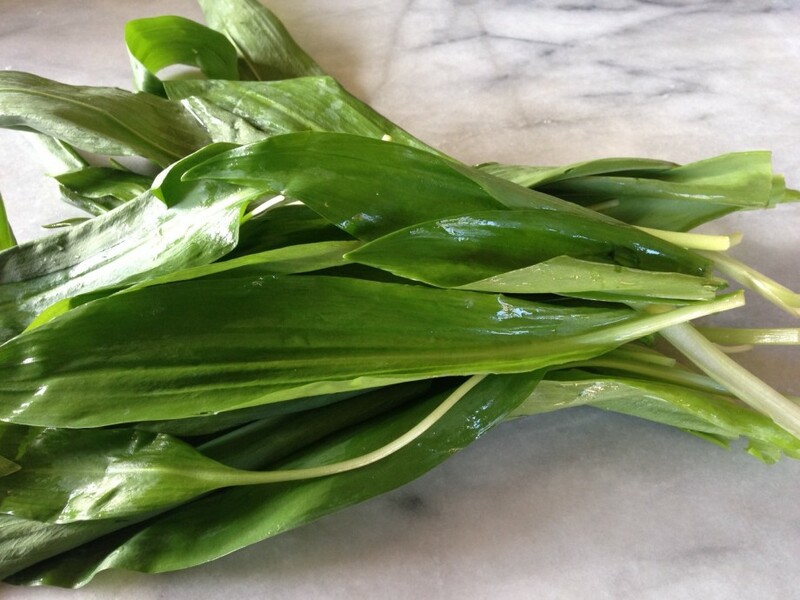 You can use wild garlic in so many ways. Treat it in much the same way as you would spinach: roughly chop and wilt in butter or liquidise with a little olive oil, salt and pepper to use as a dressing to drizzle over fish. It might be stating the obvious but do wash the leaves really well to remove any nasties and bear in mind that, like spinach, wild garlic leaves reduce enormously in volume once heated.